WhatsApp are great in our daily life for chatting with family and friend. Supposed you impulsively delete some WhatsApp message but you have regret and want to recover deleted WhatsApp messages on iPhone, what should do if you don’t even have backup? This seems very frustrating. Luckily, some professional developers have dedicated to solve those troubling iOS data loss issue with programs. 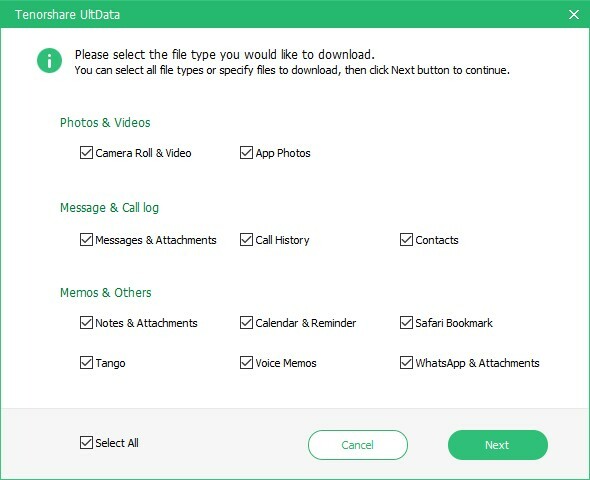 Tenorshare UltData is today’s recommendation for you as a life saver to allow you to recover lost WhatsApp data, photos, contacts, messages, notes, etc. from iPhone 7/7 Plus/SE/6s Plus/6s/6 Plus/6/5s/5c/5/4s/4. It features three modes to support you even recover deleted message in WhatsApp without backup. Just follow the below easy guides to get back what data you lost. Part 1: How to Recover WhatsApp Data Directly from iPhone 7/7Plus/6 Plus/6/5S/5C/5/4S/4/3GS? 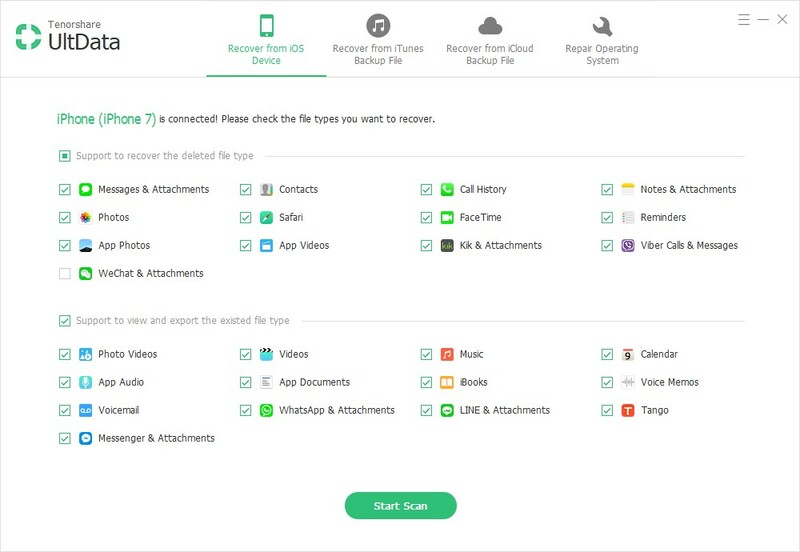 If you don’t have a backup for lost WhatsApp data, no worries, here is the helpful tips to help you recover iPhone/iPad data easily and quickly. Step 1: Connect iPhone to computer with USB cable. 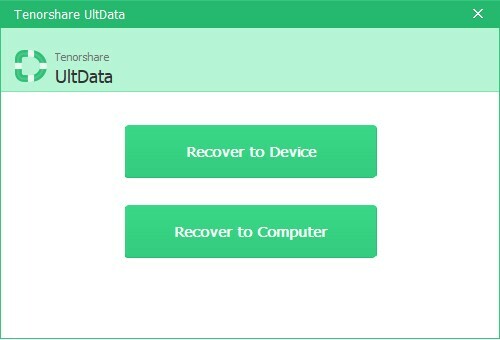 Launch UltData on your computerand select“Recover Data from iOS Device”. Step 2: Tick on WhatsApp data and Start scanning. Step 3: After scanning, you are allowed to preview with the scanning result. Step 4: Check the files you need and click “Recover” to recover accidently deleted your WhatsApp chat history. if you have an iTunes backup, you can restore lost/deleted WhatsApp chat history from iTunes backup with the below simple steps. Step 1: Choose“Recover from iTunes backup files” section and iPhone Data Recovery will automatically display all iTunes backup on this computer. Step 2: Select the correct iTunes backup file where it stores your lost data and click Start Scan button. 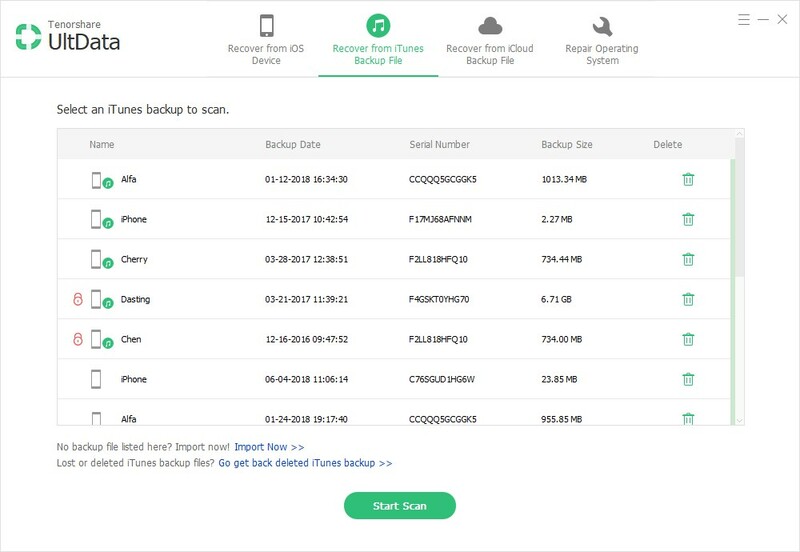 Step 3: When the scanning process completes, you can pick up items selectively and click Recover button to recover from iTunes backup. Part 3: How to Retrieve Deleted WhatsApp Message from iCloud? 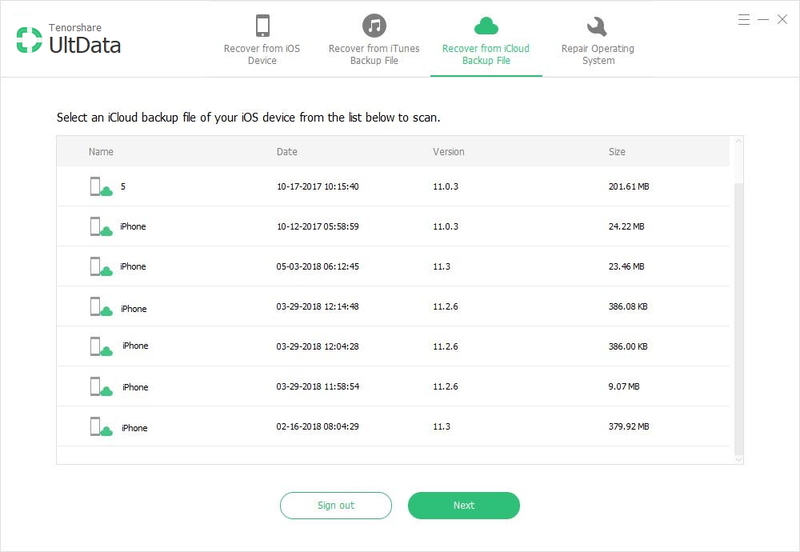 If you are lucky to have an iCloud backup for your iOS device data, it will be so easy to restore the lost and deleted files from iCloud backup. Step 1: Switch to Recover from iCloud backup files, and sign into iCloud with your Apple ID account. Step 2: Choose backup that contains your lost data from the listed backup files and click Next button. Step 3: Select WhatsApp file types for downloading and scanning and click Next button to start downloading these items from iCloud. Step 4: Pick up items that you want to restore and click Recover button. It’s wise to backup files in your iPhone/iPad regularly. But with Ultadata, you don’t need to worry about data loss. Just take it easy. This entry was posted in iPhone 6 Data Recovery, iPhone 7 Data Recovery, iPhone data recovery, iPhone data recovery without backup and tagged iphone 7/7 plus data recovery, iphone data loss, recover lost whatsapp data, recovery iphone/ipad data without backup, retrieve iphone 7 data, whatsapp data lost on June 21, 2017 by Nana.